How do you know whether the SAT or ACT is the right standardised test for your students applying to a US university? Here’s how the two tests compare. These two standardised tests are one of the most important factors governing your students’ admission to a university in the United States. Students’ SAT or ACT scores are used by US universities’ admissions staff to gauge their academic ability and either predicted or actual scores can have a significant bearing on your students’ chance of acceptance to their chosen university. But if you have students who are applying to university in the United States, it can be difficult to know which standardised test is the right one to take and which one is likely to increase their chance of application success. So what are the differences between the SAT and the ACT, and how can students go about choosing the right standardised test for them? There are a number of factors that might determine whether your students choose to take the SAT or the ACT. Here are some of the most common questions that students and guidance counselors ask. Are both tests recognised by US universities? Yes. Both the SAT and ACT are recognised standardised tests for US university application. That said, some universities and colleges may recommend or require that students take one test over the other. Which test is more difficult? This isn’t an easy question to answer – we’ll explain why later in this blog post. Suffice to say, both tests ask students to display slightly different skills and competencies. It’s not as simple as easy versus difficult. Which test takes more time? The ACT and SAT tests are broadly similar in terms of the amount of time a student is allocated. However, the way questions are designed means that some sections within each test may place more demands on a candidate’s time than others. Again, we’ll explore this in more detail later on. The competencies that candidates would need to demonstrate. Test Structure: The SAT contains four main sections: Reading; Writing and Language; Math; and the Essay component (this section is optional). The Math section is split into two parts – one with a calculator, the other without. Length: The SAT is 3 hours without the Essay component, or 3 hours and 55 minutes with the Essay component. Test Timings: 65 mins for Reading, 35 mins for Writing & Language, 25 mins for Math (no Calculator), 55 mins for Math (Calculator), 55 mins for the optional Essay component. Scoring: The Reading/Writing section and the Math section each have a total score of 800. Together they make up a combined total of 1600. Test Structure: The ACT has five total sections: English; Math; Reading; Science; and Writing. Again, the Writing section is optional. Length: The ACT is 2 hours 55 minutes if a student doesn’t take the Writing Section; if a student does opt for the Writing section, then the ACT comes to 3 hours 35 minutes. Test Timings: 45 mins for English, 60 mins for Math, 35 mins for Reading, 35 mins for Science and 40 mins if your students decide to take the optional Writing component. Scoring: Each section of the ACT uses a score between 1 and 36. A student’s total score is the average of their four section scores. The optional Writing section does not count towards the final score. 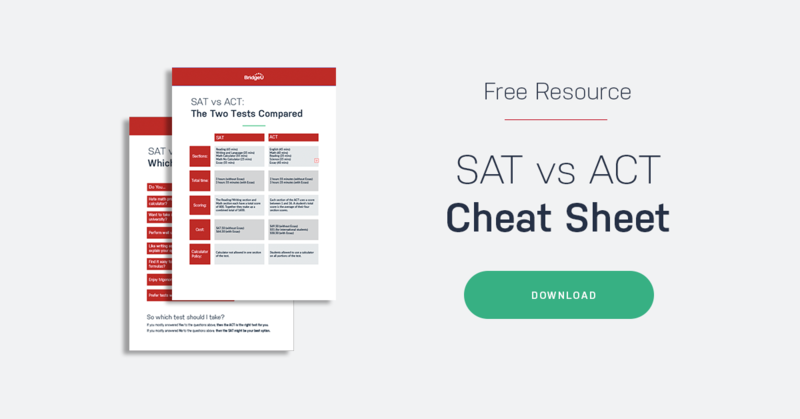 SAT vs ACT: How do the two tests compare? On the surface, both the SAT and the ACT seem to be broadly similar. But dig deeper and there are some subtle differences that may influence which test your students decide to take. Let’s look at the core aspects of each test in more detail. Command of evidence – students are asked to read a passage, and make suggested changes to the way it develops an argument or an idea. Expression of Ideas – examining how a passage is organised, and making changes to the words or structure of the text if necessary. Words in Context – students may be asked to improve word choice, to improve a passage’s tone, style or syntax and make it more precise. Punctuation and Grammar – students may be asked to change grammar, punctuation, sentences and clauses. The ACT English is broadly similar. Again, the English section is aiming to test a student’s ability to critically read, analyse and edit a piece of writing. The only real difference is that, whilst ACT candidates will mainly be asked to focus on passages of text, SAT candidates might be asked questions about tables and graphs relating to the text. Verdict: As we said, there’s not much separating the two tests. But it is worth noting that whilst there are 44 questions in the SAT section, the ACT asks you to answer 75 questions. And given that the ACT only gives you ten more minutes for this section than the SAT, students taking the ACT will have a lot less time per question. The SAT is designed to test skills that candidates would require in the real world and in university subjects including maths, sciences and social sciences. It tests concepts such as algebra, problem solving, data analysis and a “Passport to Advanced Math” section which is designed to prepare students for further/higher level maths study. The ACT is broadly the same, but tests a few competencies that the SAT doesn’t. These include geometry and logarithms. The biggest difference between the two tests is that SAT Math is split into two sections – Calculator and No Calculator. Verdict: Again, there aren’t vast differences between the two in terms of content. However, it’s worth noting that the ACT has more geometry and statistics based problems. In addition, the ACT doesn’t provide students with relevant necessary mathematical formulas – this means that ACT candidates must go into the test with the formulas memorised! Finally, the SAT does contain some ‘grid-in’ questions. Rather than being multiple choice, these are questions where the candidate has to fill in the answers themselves. The SAT and ACT reading sections both ask students to critically analyse passages from various different types of literature and answer multiple choice questions. The science reading component might ask ask a student to interpret data or analyse a hypothesis. The literary reading component might ask students to discuss how an author’s writing shapes meaning, style or tone, or to use the context of a passage to explain how a word or phrase is being used. The only real difference is that the SAT is more likely to ask students to look at a sample of a US founding document (such as the Constitution). Verdict: Both Reading tests are assessing similar skills – the only real difference is the time allotted. The ACT gives students 35 minutes, the SAT 65 minutes. Here’s the main difference between the two tests. The ACT contains a Science section, where the SAT does not. The ACT Science section tests data analysis and interpretation and critical thinking. Students are not permitted to use a calculator in the science section. Verdict: Obviously we can’t compare the two tests here. But if your students are interested in a science-based degree or major at university, then taking the ACT might be the best option. As we covered at the beginning, both the SAT and ACT essays are optional, meaning that students should only take these sections of the tests if they really want to stand out. Several notable universities in the US have stopped asking for the Written Essay component when they review students’ applications. The SAT essay asks students to read a passage of text and explain “how the author builds an argument to persuade an audience”. The SAT Essay tests a student’s ability to analyse a text, using evidence from the passage to examine the author’s use of evidence, reasoning, and other stylistic and persuasive techniques. For a full example of the SAT essay prompt, click here. Meanwhile the ACT Essay asks students to give their perspective on a statement or topic. They can either be in agreement with the statement or choose to take another perspective. Students are then expected to analyse the relationship between their perspective and those of others. For a full example of the ACT essay prompt, click here. Verdict: Again, there’s not much between the two essays, except that they are testing slightly different qualities from students. The difference between SAT and ACT is that the SAT essay only asks you to analyse a passage, where the ACT asks them to also express their own opinion. So if your students are thinking about essay component for either test, then it’s worth bearing in mind that the ACT tests more critical thinking skills than the SAT. So which test should my students take? The honest answer? It depends. There’s no simple answer to the question of which test is right for your students. The best strategy is for students to research each test, practice as much as possible and then make an informed decision. After all, when students take their chosen test, they want to maximise their chance of success – this will only happen if they are sitting the test that plays to their strengths! So, if you have students who don’t perform quite as well under time pressure, or who may prefer to answer fewer questions in a short space of time, then the SAT might be the more suitable test for them. On the other hand, students who may be thinking about a science related track at a US university should think about taking the ACT, as there is a specific Science section which may help their application to stand out. That said, the SAT Math sections also test certain competencies that would be useful in a Science based degree. If students aren’t sure, or would like to get an idea of which test may be more suited to their abilities, it’s worthwhile taking practice versions of each test. Both Collegeboard (who run the SAT) and American College Testing (who run the ACT) allow students to see example questions and take practice tests. To help your students decide which of the two standardised tests is right for them, download your free cheat sheet, with a handy summary of the two tests and a simple questionnaire to help your students to decide between SAT and ACT.